In his first column for TechRadar, broadcaster and Football Ramble presenter Pete Donaldson looks at the strange world of gaming, and wonders if 2017 can live up to last year's high bar of crazy. Well it happened, didn't it? That vain, pouting kumquat actually lives in the White House now. Probably flicking through swatches of gold leaf destined for the oval office desk as we speak, in fact. But as the maid pulls piddle-proof sheets taut across the Lincoln bed, perhaps we should be looking to video games for answers. For some flavour of 2008, Obama-level hope. Yes, back in '08, anything seemed possible – Sackboy was enchanting the gaming world with his sunny disposition and soulful onyx eyes, work on the Last Guardian had begun (stop laughing) and Ronaldinho was still marketable enough to make the cover of FIFA. Now, as graphs plotting the value of our national currency begin to resemble the world's least imaginative Line Rider level – a rather unceremonious plummet into oblivion – it's time to find solace in our hobby. The thing that's always been there for us, through the bad times and the good. But if gaming is ever a reflection of the humans that create its worlds, then we are well and truly in trouble. Because gaming is as weird as ever. We'll be looking ahead at some of the oddness on the horizon in 2017, but if last year is anything to go by, they'll surely find it hard to beat Who's Your Daddy. A frantic online player-versus-player experience that pits a clueless father against his infant son in a five minute battle of wits, Who's Your Daddy gives a father three minutes in which to child-proof a home while looking after said child, and a baby the chance to end himself using chemicals, electricity, or sharp objects. Presented in a cartoonish, 3-dimensional clip-art style, it's a frantic race against time that's almost Tetris-esque in its intensity. The image of a baby downing a bottle of bleach in a bathroom cupboard or snaffling raw chicken fillets would be horrific, were the game not so much bloody (literally and figurative) fun. Pro tip: Knock the television onto the glass coffee table and consume the shards. The Dad will be too busy hiding the knives, the big lug. Hurrah! Assassin's Creed 2 is getting a remaster in something Ubisoft are calling the 'Ezio collection'. Can't wait to get my climb on in Italy, and...is that man's face made of corned beef? Something went devastatingly wrong when developers got their Ubi-fingers on the remaster, and where once there was a chap with a strong jawline and dreamy brown eyes, in his place stood a meaty, Frank Sidebottom fever dream. Honestly, what is it with AC and faces? If the NPCs aren't wearing skin that would make an actual haggis consider Tinder, they're losing their entire skulls altogether and peeping from under their powdered wigs with glassy, floating eyes. What's that coming over the hill? It's a monster. It's a bloody great big gaming monster and it wants to charge you around fifty of your worthless Brit-pounds for the pleasure of its company. Seriously, if you thought 2016 was an odd one, with titles such as Last Guardian and Final Fantasy 15 both finally hitting shelves – this year might actually send you running for your fallout bunker. No one would blame you. In truth, this one does look incredibly fun and unspeakably adorable, our titular characters resembling the kind you'd see in a soviet-era cartoon preaching importance of hiding under your school desk during a nuclear attack. Coming out a full four days after the inauguration, while President Trump waddles about the Whitehouse trying to find a code for the photocopier, you could be enjoying the frankly insane delights of this Yakuza prequel. The fifth episode of the game was given away for free last August, and for those of us who dusted off their PS3 for their introductory taste of the series, Yakuza 0 is the first truly necessary purchase of the year. From their celebration of the minutiae of the modern Japanese convenience store to the part where a woman at a bowling alley gives you a live chicken as a prize, the variety in Yakuza 0 is as enchanting as are the souped-up PS4 neon-tinged enhancements. Just get it, will you? At the 2016 edition of The Game Awards we got to see what D. Trump might call some 'amazing, amazing things.' Host Geoff Keighley in a boxy charcoal grey number; Hideo Kojima taking home an Industry Icon Award for services to pachinko, and a couple of smiling YouTubers gleefully and tonelessly shouting 'That Dragon, Cancer!' into a Sennheiser. One of the other things was the first sight of a gameplay demo for the forthcoming Mass Effect: Andromeda. ME:A is a fresh start for the celebrated series – but many on social media noted a slight...oddness in our lead's facial animation. 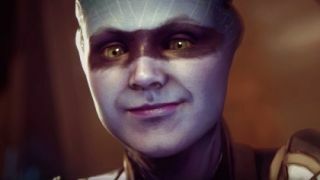 Creative director Mac Walters piled in early (Bioware all too aware of their rather demanding fans - the Mass Effect 3 ending made internet crybabies cry a river,) assuring us that all aspects of the game will continue to be worked on right up until release. Which, in fairness to the Twitterati, was just three months away. Anyone looking forward to an new year bun fight where every armchair commentator suddenly becomes an expert in facial animation, morph targets and key-framing should look no further than whatever happens once Ryder takes his or her helmet off and belms through the first few lines of dialogue in late March, so watch this space. Though what our bockety-faced heroes look like during climax is territory better left unexplored. With China strutting around the South China sea like some kind of aquatic Mick Jagger and an unfolding fiscal crisis at home, culturally the Japanese might be forgiven for retreating into the comforting bosom of their past glories. Deadly Premonition was the sleeper hit of the last console generation, swiping hard right on crazy and ending up as a buggy yet eerily compulsive Twin Peaks fever dream. News from Osaka is that creator Hidetaka Suehiro has created a brand new development studio, White Owls Inc. Suehiro is pictured on their website with requisite nocturnal bird of prey, directing all PR questions to a toy monkey, which is apparently the studio's press department. We've met worse. Either way, for anyone who abhors the gaming vanilla, it's monumental news. Anyone for a turkey, jam and cereal sandwich?